The U.S. CPI data for August was somewhat below expectations (BLS web page). A low level of CPI inflation is not too surprising; the only real surprise in inflation since the financial crisis is the lack of deflation, given the large amount of excess capacity in the economy. The chart above shows the annual rate of change for the CPI, and average hourly earnings since 1965. 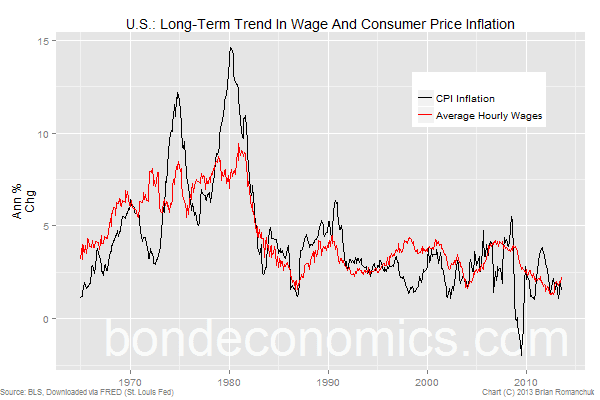 The close relationship between wage and CPI inflation is to be expected; labour costs are a very large proportion of the cost of most good; the most notable exception is gasoline (which generates a significant portion of the volatility in the CPI). The amount of slack in the labour market would appear to indicate that it will take a long time for inflation to perk up. Therefore, the main directional driver for the bond market will be the outlook for growth, not inflation data.